Washable Ink Pads 3/Pkg - HAMPTON ART-Washable Ink Pads. This set features three great colors to be used with any of your stamping projects. 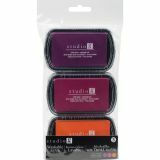 This package contains three 4x2-1/2x1/2 inch ink pads. Design: Brights. Conforms to ASTM D 4236. Imported.